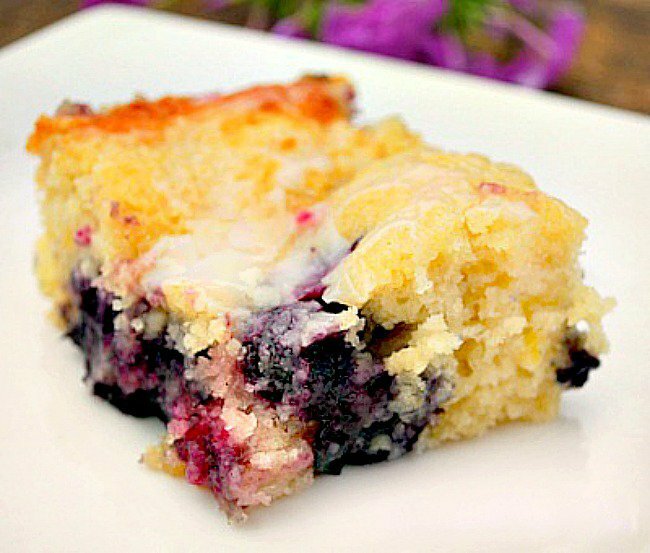 Lemon Blueberry Pudding Cake…a layer of warm saucy blueberries topped with a lemon flavored cake that is very moist and tender. I wish this would have lasted longer but it didn’t, it was gone in a flash. 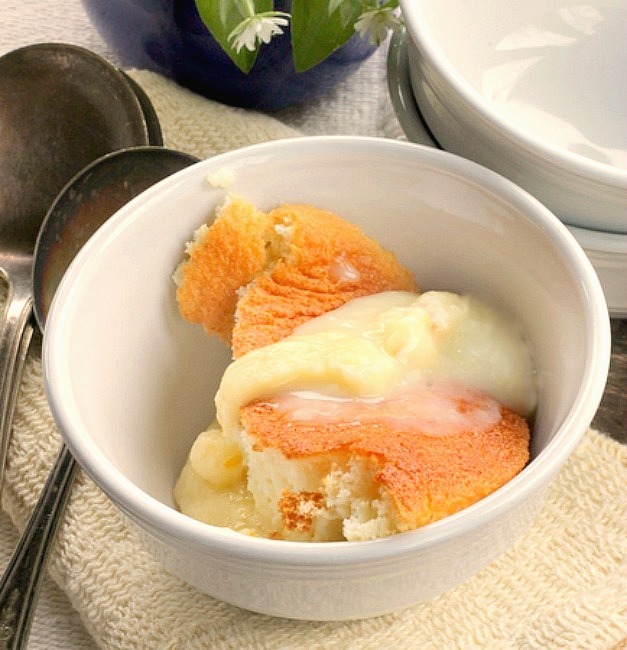 This was an interesting recipe to me because… one, I’ve never made a pudding cake before and two, I was intrigued by the idea of pouring the boiled lemon and sugar flavored water over the cake batter before it baked. 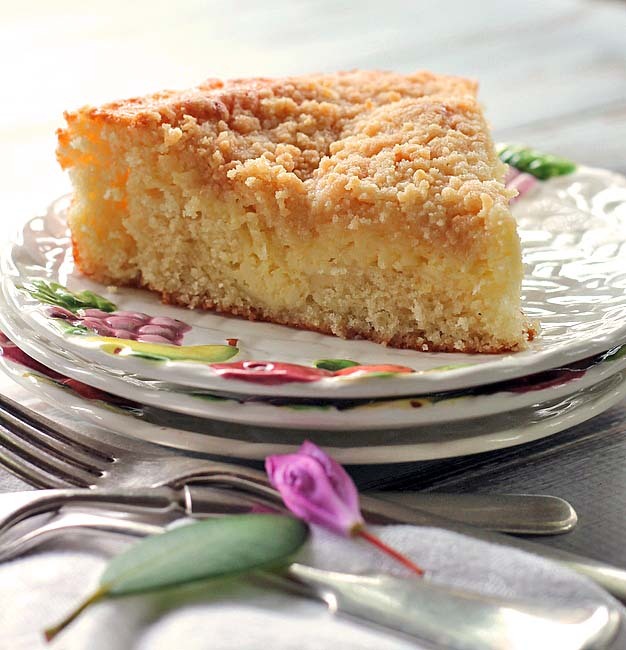 I was totally amazed that it baked into the cake and gave it such a wonderful lemon flavor. Not only that, but the cake portion was very soft and tender to boot! You could serve this cake as is and absolutely love the lemon and blueberry flavors. You could also dress it up with a dollop of whipped cream or a small dip of ice cream. Anyway you serve it, you’re going to love it! Enjoy! Lemon Blueberry Pudding Cake is a delicious cake with a layer of blueberries on the bottom and a delicious lemon flavored cake on the top. Preheat oven to 350 degrees. Grease an 8 inch glass baking dish with shortening. 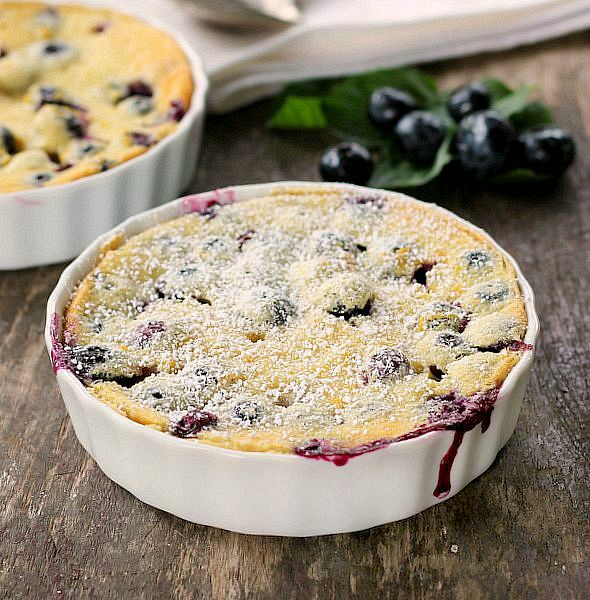 In a medium bowl, toss the blueberries with 1/3 cup of sugar, place in the bottom of the glass baking dish. 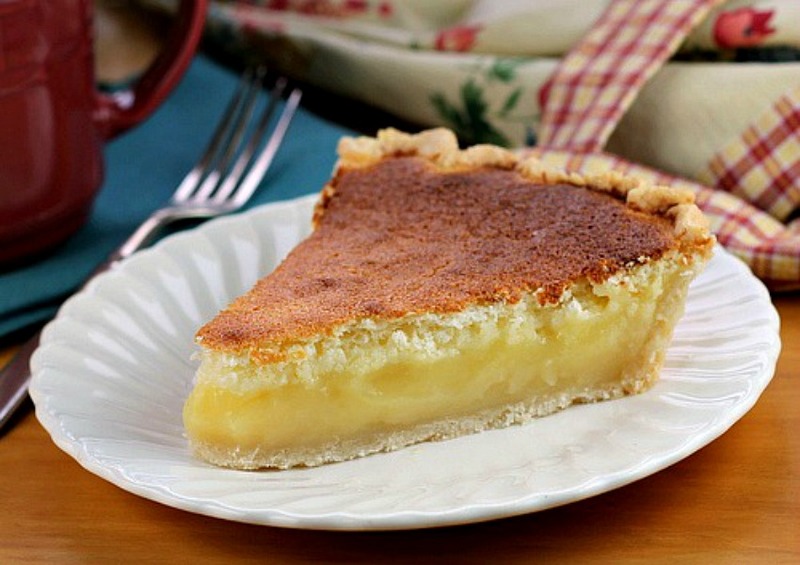 In the bowl of an electric stand mixer, beat the butter and sugar until light and fluffy. Add in the eggs one at a time, beating until well incorporated with each addition. Add the vanilla and lemon zest, beat on low till just incorporated. Combine the flour, baking powder and salt in a large bowl, whisk to combine. Add the flour mixture to the butter mixture alternately with the milk. Always start with the flour and end with flour. Beating only until just incorporated with each addition. Spread the cake batter over the blueberries evenly. Set aside. In a small saucepan bring the water, lemon juice and remaining 1/3 cup sugar to a boil. Pour over the cake batter. Bake cake at 350 degrees for 50 – 60 minutes until cake is firm to the touch, golden brown and bubbly around the edges. Cool slightly, serve with whipped cream or ice cream if desired. really niceee this one i seen first time. Thank you d design, I hope you get to try it! Blueberries are my favorite fruit. This lemon blueberry cake looks so good right now. Thank you Valerie, it’s definitely a keeper! This looks fantastic. I like pudding cakes also. Lemon ones in particular. Most lemon ones you have to separate the eggs and beat the egg whites. Love that you don’t with this one. I also like the addition of the lemon juice in the water. Plus blueberries and lemons are a winning combination. The only problem is my granddaughter was here yesterday and snacked on my blueberries all day so I’m out of them. I guess I will have to send my husband to the store on his way home from work tonight. TerriSue blueberries don’t last long here either! But it’s nice your grandbaby loves eating them! This sounds fantastic. I love the simplicity of the recipe while, as a fan of blueberry and lemon combos, knowing that it’s going to taste great. I cannot wait to try it. Thank you Amber, I absolutely loved it! Yum! A couple of my favorite flavors! It looks absolutely delicious! Looks so yummy! Pinning to try this summer. Dropping in from a linkup. This looks wonderful. All of a sudden a few months ago I stopped getting your updates. I subscribed again and I still am not getting them. I saw this on another blog. Charlotte , at the moment I’m having trouble with the site I use to make the newsletter. Hopefully it will get fixed soon. This looks amazing! Perfect for a summer treat! Thanks so much for taking the time to come by and link up at the #HomeMattersParty – we hope to see you again on Friday! Hey, Bunny! Just wanted to let you know that we loved your link to the #HomeMattersParty so much last week that we featured it this week! Would love for you to come by and check it out, if you have the time! http://theroadtodomestication.com/2015/06/19/home-matters-linky-party-42/ Happy Friday!!! Thank you Bunny for the nice recipe. You’re welcome Liz, thank you for stopping by! 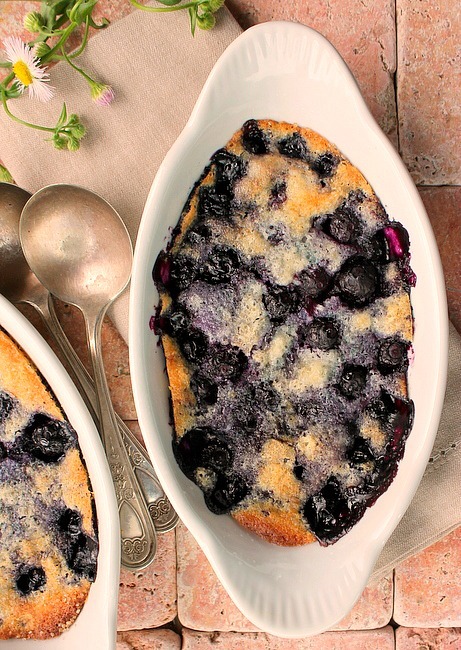 What a great way to use up summer blueberries! Looks wonderful! This looks delicious. Will the same batter work with other fruits? Razena i don’t see why not. I think other berries work work just fine.